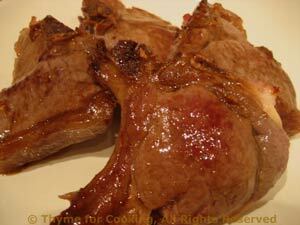 Lamb Chops with Garlic, Thyme for Cooking seasonal main course. Sprinkle paprika, salt and garlic powder on lamb chops. Heat oil in large nonstick skillet over medium high heat. Add chops and sauté 2 - 5 minutes per side, depending on thickness of chop and desired doneness. Make a slit and peak if not certain.